Okay, I’m a biker. 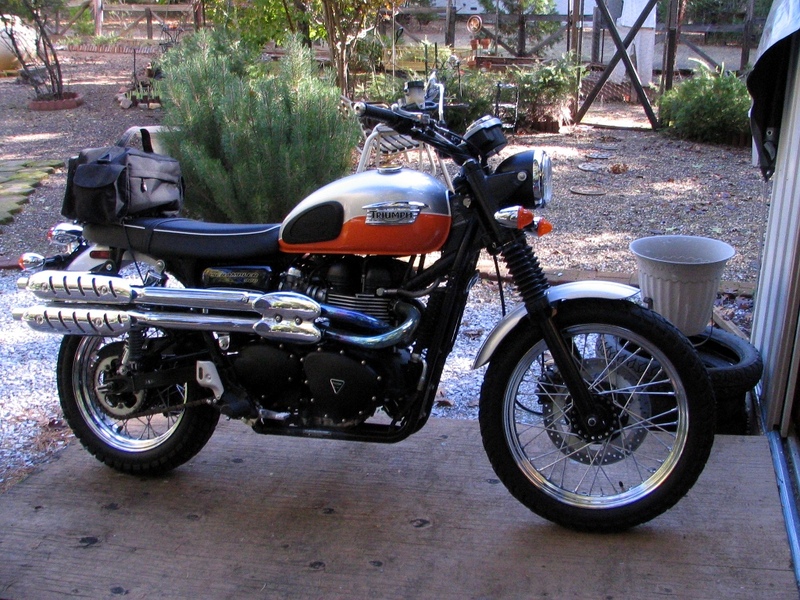 I’ve been riding motorcycles for more than forty years, have owned more than a dozen, and currently have a ‘thing’ for Triumphs. Actually, I’ve had this affliction for quite a long time. Good machines. 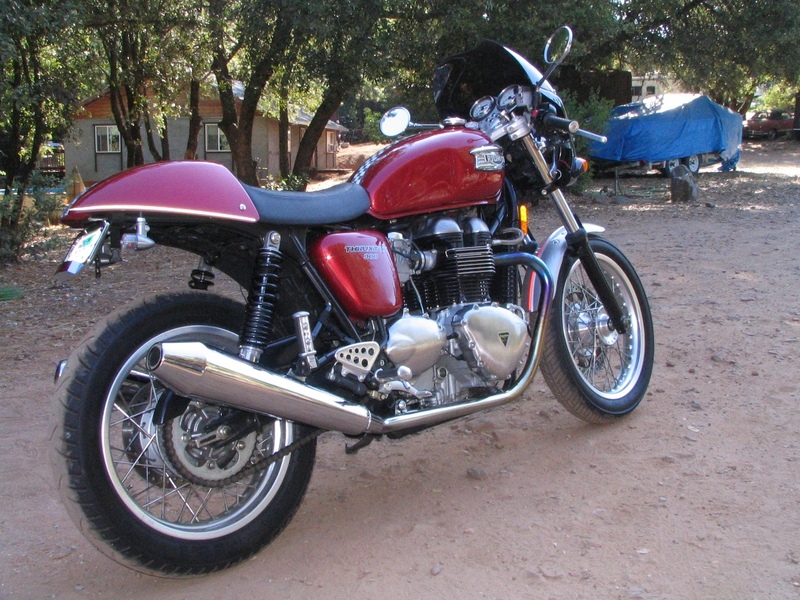 As my situation evolved I had to sell the Thruxton. We ‘downsized’ to a smaller place, and I had to sell many of my toys. 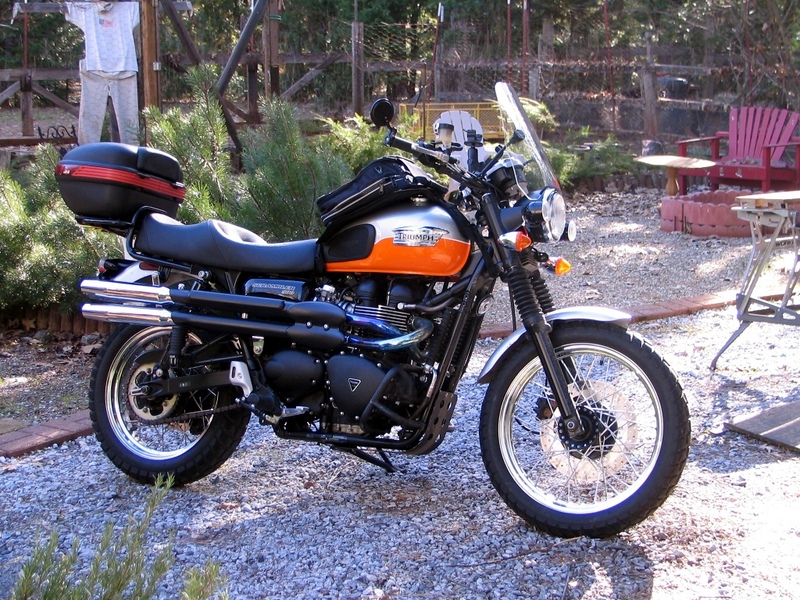 Along the way I discovered the ‘Scrambler’ model introduced by Triumph in 2006. Really more a styling exercise than anything, the bike had real potential to be a very cool statement. Back in the late 90’s, Triumph had introduced the model they called the ‘Tiger’, based on the same 900cc 3-cylinder engine that powers my ’97 Trophy. 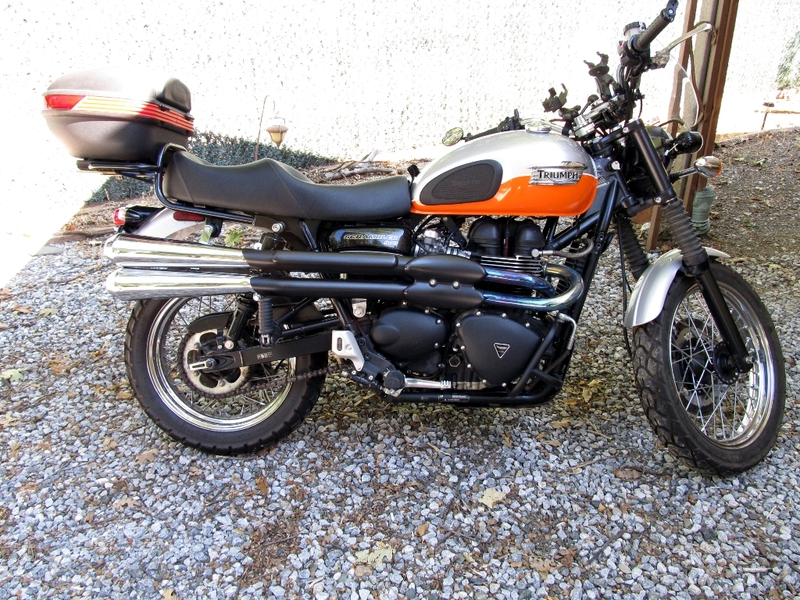 I rode one back then on loan from the dealer where the Trophy was being serviced, and liked the concept of an ‘adventure touring’ bike. Then along came the Scrambler, and I got the idea of a ‘Tiger Cub’ concept. A bike based on the simpler, easier to maintain air-cooled twin. I watched eBay for many months, and had decided to find myself an ’08 in the Silver/Tangerine motif. My diligence paid off, and I found the bike that became known as ‘Buffy’. The mods began, focusing on both appearance and function. Lighting was improved and enhanced with LED auxiliary lights up front, and integrated running lights at the rear. A ‘top box’ (trunk) was added to provide a bit of locking storage. Case guards and a bash plate were added to provide some protection for the engine on the off-pavement excursions. A plush seat was added to give my bony olde tush a bit more cush. 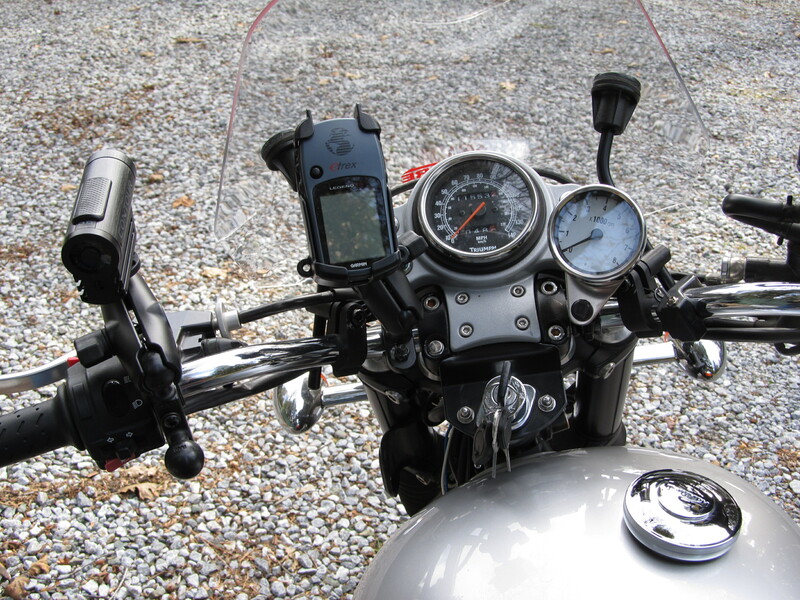 Also added were the windscreen as well as mounts for my GPS and a video camera to capture some of the action. 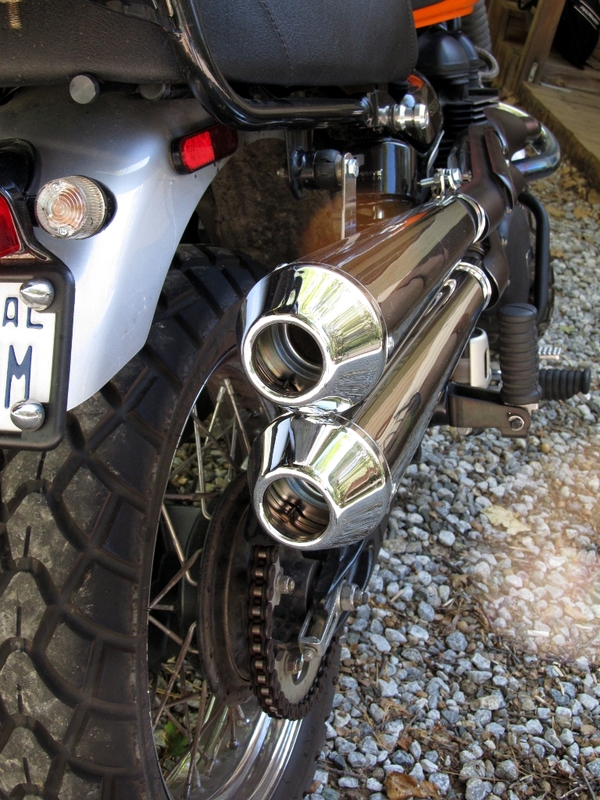 I’m not a ‘loud pipes’ guy; but then again – a twin should have a certain amount of ‘character’. 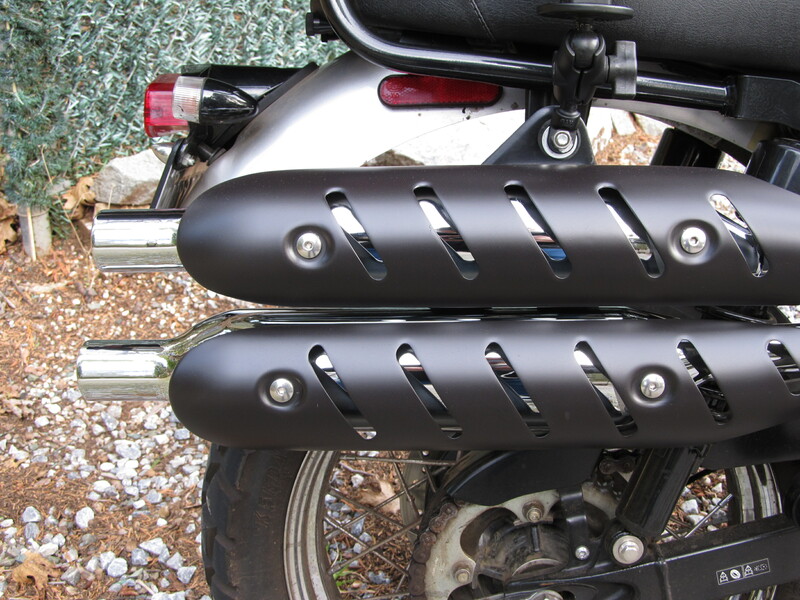 I also wanted to do away with some of the chrome, and liked the matte black finish on the engine, so I did some custom work on the exhaust system. 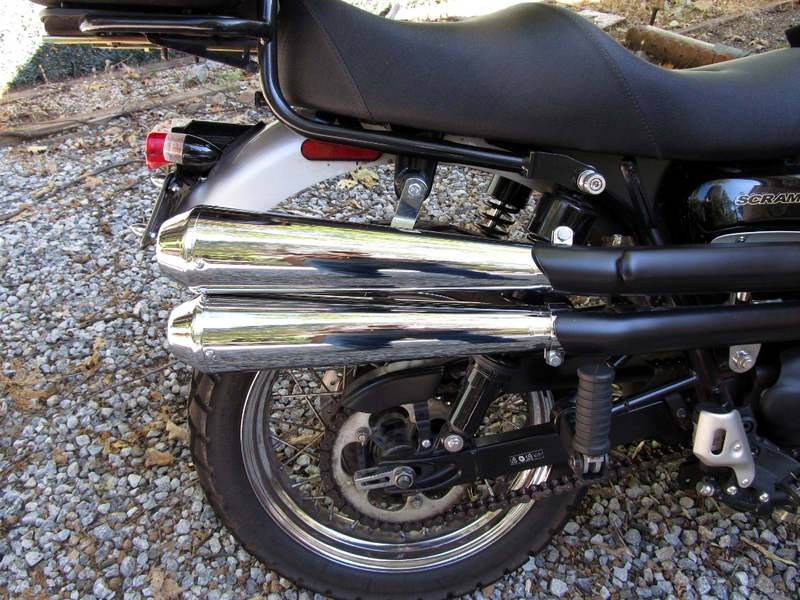 I got rid of the gaudy stock ‘sewing machine’ exhaust and bolted up some ‘universal’ mufflers after prepping and painting the heat shields to match the matte black. Overall side view – Pipes look pretty nice I think! Okay, well… those pipes looked good, and even sounded pretty good; but there were two problems which could not be ignored. First, the bike ran poorly with those pipes and jetting changes didn’t solve it easily. 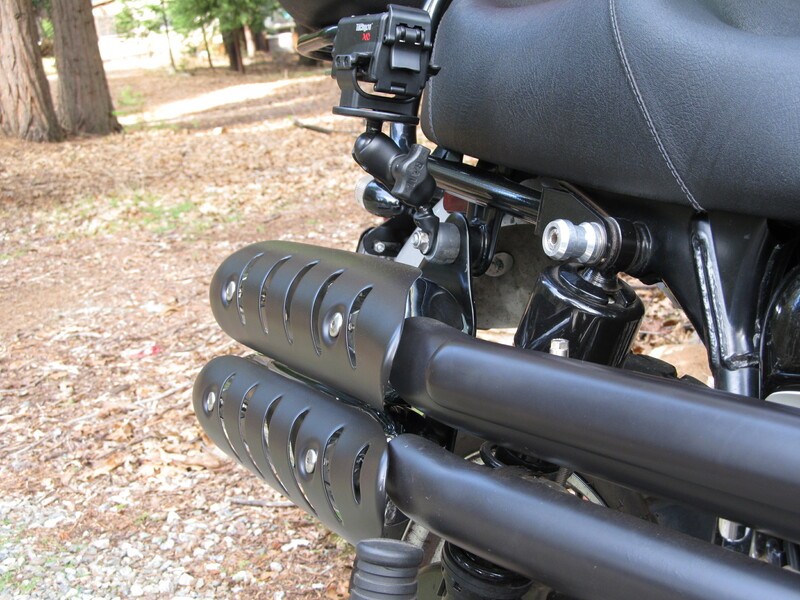 Secondly, they would have interfered with the Saddlemen luggage I use on this bike (no heat shields), so…. and here’s one of the new cockpit, showing the new tachometer, the GPS, and the forward-looking video camera. Buffy looks and sounds great! The tail light / turn signal kit is from NewBonneville.com. The rack is a Renntec.